Sarang semut in English is ant nest. The traditional medicine from Papua Island. The origin people of Papua believe that can cure cancer, tumor, tubercolosis and many other. Ant nest is a plant of Hydnophytinae (Rubiaceae) associated with ants. These plants are epiphytes, meaning that attaches to other plants, not a parasite on its host's life but only use it to stick. Examples of other epiphytes are commonly found living in trees are lichens, mosses, algae, plants and orchids perambat. 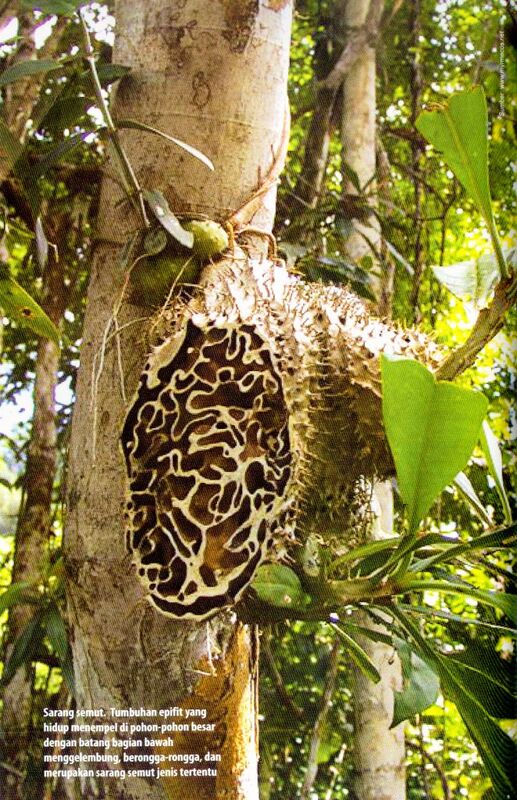 Actually there are five genera of the family Rubiaceae ant nests, but only the genus Hydnophytum and Myrmecodia the closest association with ants. Ant nest genus is divided into several species based on the structure of the tuber. Hydnophytum consists of 45 species and 26 species Myrmecodia so there are 71 species of ant nests. All species of this plant has ballooned, hollow rod-like cavity of the fruit that is generally inhabited by ants. In ecology, ant nests spread of mangrove forest and the trees on the beach to a height of 2400 m. Ant nests most commonly found in pastures and rarely found in lowland tropical forests, but more usually found in forests and agricultural areas with an altitude of about 600 m. papua anthill He found a lot of stick in some trees, generally in the eucalyptus tree (melaleuca), mountain pine (casuarina) Kaha (Castanopsis) and beech (Nothofagus), but rarely on a tree-trunk tree with smooth and responsive as Eucalyptus. Ant nests are also grown on treeless plains with low nutritional and above the height of the tree. In their wild habitat for ants nest inhabited by various species of ants and often by three species of the genus Iridomyrmex. Identify what we did to ant nest Myrmecodia pendens shows that this plant is inhabited by colonies of the ant species Ochetellus sp.